Boneless pork shoulder can be tough, but when braised and simmered, as in this stew, it becomes tender and succulent. 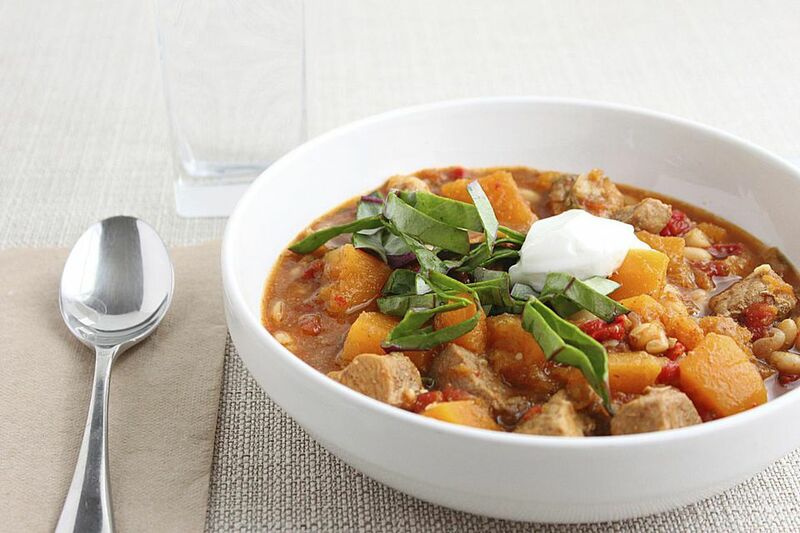 The sauce, made with curry powder and cumin, is fragrant and flavorful — and the perfect match for the butternut squash and pork. Serve the stew with some crusty bread to mop up the sauce. 1. In a 4- to 5-quart Dutch oven or large pot, heat the oil over medium-high heat. Cook half the pork until brown on all sides. Remove with a slotted spoon to a plate. Repeat with the remaining pork. 2. Reduce the heat to medium-low. Add the onions, garlic, curry powder, and cumin to the drippings. Cook, stirring often, for 1 minute, until the onions are coated with the spices. 3. Add the broth, tomato paste, salt, and pepper. Stir to scrape up the browned bits on the bottom of the pan. Bring the mixture to a boil over high heat. 4. Return the meat to the pan and reduce the heat to low. Cover and simmer for about 1 hour, stirring occasionally. 5. Stir in the butternut squash and the potatoes. Cover and simmer for 30 to 40 minutes, stirring occasionally. Add the peas and simmer 5 minutes longer, or until the meat and vegetables are very tender and the sauce is slightly thickened. Serve hot. • To peel the butternut squash, cut off the top and bottom ends, then halve lengthwise. Use a large spoon to scrape out the seeds and fibers. Place cut side down and cut off the outer skin with a sharp knife. • One of the major hurdles to preparing winter squash, such as butternut, is cutting it in half. You can always use a heavy chef’s knife or a cleaver and exert some pressure. An easier method is to partially bake the whole squash until it is soft enough to yield easily to a knife. Place the squash in a 350°F oven for 15 to 20 minutes, or until the skin is easily broken by pressing with a thumbnail. Remove the squash and cut as directed.